Video Courtesy of the Ad Council. Every year, safety features in vehicles evolve. Eventually smart automatic braking, modern airbag systems, electronic stability control, rearview cameras, park assist, and more, will be common to every vehicle on the road. Most advanced safety features will be automatic, much like standard airbags and anti-lock brakes are today. The convenience of automatic safety features is something to be considered, yet an incredibly essential factor in car safety that is not automatic is the seat-belt. The laws of the courts and of self-preservation dictate that it is the responsibility of the driver, and all passengers, to utilize seat-belts. Unfortunately, many people still disregard seat-belts as unnecessary. Without airbags, it’s more likely that, during an accident, a driver’s or passenger’s head will bang against the dashboard, windows, or the steering wheel, all events that can critically damage a person’s skull or brain. Without anti-lock brakes, a vehicle is more likely to spin out of control, and hit other cars, people, or run off of cliffs. Without seat-belts, the force of an accident on the body is significantly greater, and the likelihood of flying through windows and incurring severe injury or loss of life, grows enormously. Statistics show that up to 64% of vehicle passengers ages 21 to 34 that were killed during an accident were not wearing seat-belts. “Ejection from the vehicle is one of the most injurious events that can happen to a person in a crash. When an accident occurs, the vehicle is abruptly forced to a stop. As most people know, any loose object in a vehicle will continue moving forward even after a stop is complete. With a stretching seat-belt, the force of an accident upon a 160 lb driver is 3200 lbs, with a deceleration of 20 g’s. With no seat-belt the force of an accident upon a 160 lb driver is 24,000 lbs, with a deceleration of 150 g’s. “With no seatbelt to stop the driver with the car, the driver flies free until stopped suddenly by impact on the steering column, windshield, etc. The stopping distance is estimated to be about one fifth of that with a seatbelt, causing the average impact force to be about five times as great. The first (very few) vehicles offered with built in seat-belts were introduced by Volvo in the mid 1800’s. It wasn’t until the years 1966 to 1970, over 100 years later, that seat-belts became an expected component of every vehicle. 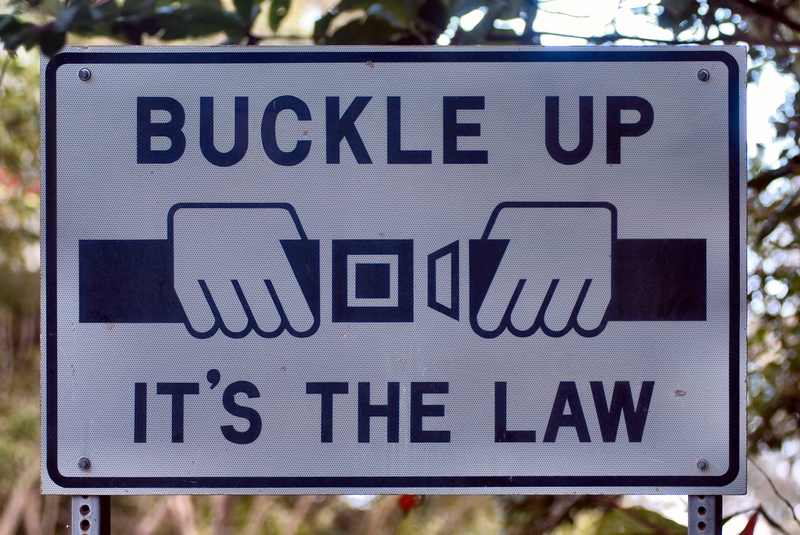 1989 was the year most states decreed seat-belt use laws be put into place. Today, after almost 160 years of struggle to encourage automakers to provide seat-belts, as well as states to require their use, some people are still not exercising constant use of these amazing tools. So many vehicle accidents happen everyday. Unfortunately, it’s irrelevant if a person hasn’t had an accident during his or her whole life. It only takes one.